A yabby is a crayfish but a cray is not a yabby: what’s in a name? The burrowing crayfish Engaeus cymus is not a yabby. Everyone knows what a yabby is, don’t they? Well, you would be surprised. Those charming little critters with nippers in your local dam may belong to the species Cherax destructor, also known as the common yabby, but they may also be juvenile spiny crayfish (genus Euastacus), adult burrowing crayfish (genus Engaeus) or another species within the genus Cherax, including gilgies, marron and redclaw. As a scientist who has worked on Australian freshwater crayfish for decades, the diversity of common names in this group is one of the most frustrating part of the job. It is not that I mind people using the vernacular or that I refuse to use it myself, it is just frustrating to be labelled an idiot by well meaning locals. Here is a typical scenario: I am poking around in a creek in some remote location, with my laminated scientific collecting permit tucked into the field kit, and a farmer or fisher or curious teenager asks me what I am doing. The answer is simple, I am trying to collect the rare and beautiful species (insert scientific name here) for the purposes of research. But how do I explain it to someone who thinks that species is a yabby, craybob, lobster or gilgie? If I use the scientific name I sound like a wanker, and if I use the word yabby I will be lying (becuase I almost never go in search of Cherax destructor). Invariably, whatever word I use I will stand corrected by the local, who has lived their whole life calling that species (insert “common” name here). And at that point I lose credibility. Doubt and suspicion floods their eyes. How can I be a crayfish expert if I do not even know the “correct” name for their local crayfish? My own humiliation is only the tip of the iceberg. Because many species of freshwater crayfish have limited distributions and are therefore rare and threatened, it is dangerous when the locals consider them to be “common”. It is even more dangerous if they think they are yabbies, because the fishing regulations for yabbies are quite generous (you can kill and eat 200 per day). On the other hand, any species in the genus Euastacus (also known as spiny crayfish, which includes the mighty Murray cray) are protected from fishing if they are under a certain size. 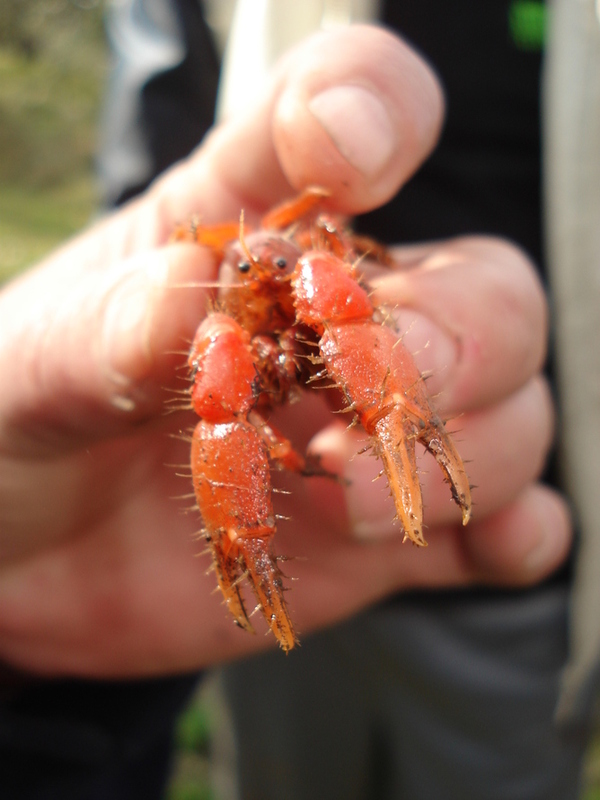 People who assume that all small crayfish are yabbies may be scooping up endangered species to use for bait. It happens all too often and is one of the threatening processes for the group. Extinction by obscurity. The assumption that an unknown crayfish is “just a yabby” is dangerous for the crayfish. The surprising and important fact that most Australians do not know is that there are almost 140 species of freshwater crayfish in Australia, in 10 genera. The genus Cherax includes the yabbies, gilgies, marron and redclaw, but also a couple of dozen other species that have no common name at all. The genus Euastacus are usually known as crays (but so are marine lobsters in Adelaide, and that is another group entirely) and there are currently 50 different species. Burrowing crayfish live underground most of the time, and they belong to the genus Engaeus if found in Victoria aor Tasmania, the genus Engaewa in Western Australia, or the genus Tenuibranchiuris near Brisbane. Two additional genera are found only in Western Victoria, and three more in Tasmania, one of which (Astacopsis) is the largest freshwater crayfish in the world. All of them are special, and none of them can be described using their common names. One species of Astacopsis is also known as the Giant Freshwater Lobster, a great common name that confuses me by using a word for a freshwater creature that is normally used only for animals found in the ocean. I guess Tasmanians don’t like to follow the rules. The point I am trying to make is that if you are lucky enough to have a creek or river or swamp near you that is full of creatures that look like yabbies, take a moment to consider the possibility that they may instead be the critically endangered Euastacus robertsi (which are purple underneath) or the critically endangered Cherax leckii (which looks just like a yabby). In some locations, such as Fitzroy Falls, you can catch yabbies in the same net as a critically endangered Euastacus. It is your responsibility to learn how to tell them apart. Most people do not plan to do any harm to these beautiful and amazing creatures, but most people do not think they are doing any harm when they set out to have a feed of yabbies. Just bear in mind that not all crayfish are yabbies. Some of them are rare and beautiful and have no common names at all. Susan Lawler is Head of Department, Department of Environmental Management & Ecology at La Trobe University.